A dental implant is an artificial tooth root made of titanium which replaces the missing tooth. The implant surgeon inserts the implant into the location where the tooth needs to be replaced. The titanium then heals and fuses with bone over the next few months. After "osseointegration", an abutment is attached, which is the component that connects the implant to the crown. Just like the tooth root did before, the implant then builds a stable foundation for the crown, which will become the visible part of your new tooth. Your implant procedure is computer-planned by Dr. Heldt, an implant dentist specializing in computer-guided implant surgeries. Dental implants are placed minimally invasively, using cutting-edge technology and contemporary surgical techniques. Less than 5% of implants are done this way. 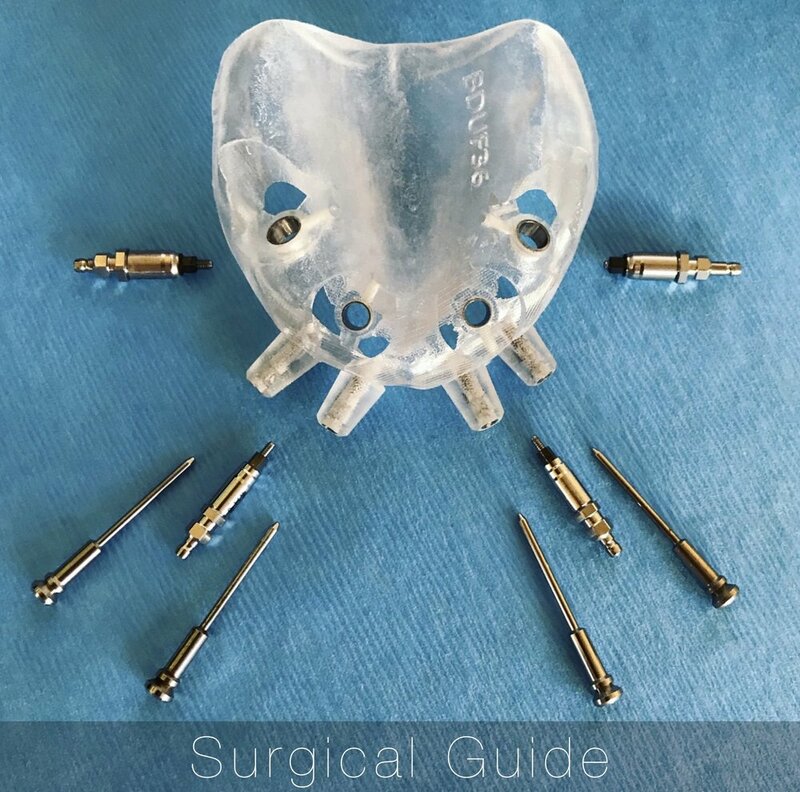 A surgical guide is designed and manufactured to be utilized during implant procedures for precision placement. All implants are planned using software: no shortcuts or compromises. Highly precise, minimally invasive, low pain, rapid healing. Case by Dr. Heldt: Surgery + Prosthetic. Shorter procedure since everything was planned on a computer, reducing surgical time length. Minimally invasive: the alternative to using the surgical guide is to cut and peel back the gums to visualize the bone. This approach takes longer, is more painful, has longer recovery, more inflammation, less predictable, and ultimately is not very accurate. With a surgical guide, most patients discontinue pain medications after a few days. Losing all your teeth and want your replacement teeth the same day? Tired of a loose denture and ready for a solid solution? All-on-4® is a set of fixed teeth anchored to implants. Very high patient satisfaction with success rates exceeding 96%. Bring in a photo of the smile you want, we’ll start the process.